﻿﻿﻿﻿What to see and do all along the Texas coast. ﻿From windswept beaches to tangled oak mottes, remote islands to bustling cities, alligators to whooping cranes, the Texas coast runs the gamut. It also runs some 350 miles, edged by one of the most diverse and vibrant bodies of water in the world. That adds up to so many chances for a good time, you may wonder where to start. Here’s our guide to the best of what to do and where to go on the Texas coast. › Beachcomb on five mostly deserted miles in Sea Rim State Park near Port Arthur, or 21 miles on mostly uninhabited San Jose (or St. Joe) Island, a short ferry ride from Port Aransas. › Turn sand into castles or other amazing creations with a lesson under the tarp of jovial castle-master Andy Hancock, next to Boomerang Billy’s on South Padre Island. 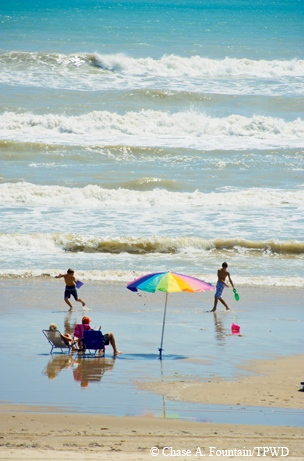 › Venture past the first three maintained miles on 20-plus-mile-long Matagorda Beach in Matagorda County. › Explore 60 miles of sand, 55 of them four-wheel-drive only, on Padre Island National Seashore, the longest undeveloped barrier island in the country, great for shell hunting. In spring and summer, watch out for nesting sea turtles! The Texas coast boasts outstanding, world-class fishing from end to end. The most popular targets for anglers are spotted seatrout (or speckled trout) and red drum (or redfish), along with flounder, black drum and sheepshead. “One of the interesting things about fishing the Texas coast is you never really know what you’re going to catch,” says Greg Stunz, a fisheries scientist at the Harte Research Institute. “There’s something for everyone. Fish are abundant, and they bite on a variety of baits.” Whether standing on the jetties with an inexpensive rod and reel or aboard a pricey boat with a top-notch rig, you’re likely to catch fish. › Charter a fishing boat in Port O’Connor and drop a line in Matagorda Bay or Espirtu Santo Bay, off-the-beaten path places where you likely won’t have much company or competition. State Park jetties. Watching what everyone else catches adds to the fun here. › Wade into the shallow, 600-square-mile, hypersaline Laguna Madre and toss your bait toward redfish tails sticking out of the shallow water. It’s about as close to catching fish from a bucket as you can get without actually doing so. › Moody Gardens in Galveston, where the Aquarium Pyramid is home to 10,000 animals including a wide variety of tropical fish, sharks, seals and penguins. › Texas State Aquarium in Corpus Christi, displaying more than 250 marine species including dolphins, tarpon, sea turtles, jellyfish, otters, stingrays and seahorses. Don’t miss feeding time at the Flower Gardens exhibit, which is a replica of the national marine sanctuary. ﻿South Padre Island Birding and Nature Center. › High Island, near Winnie, to spot vireos, warblers and more in the Houston Audubon Society’s sanctuaries; migratory woodland species peak mid-March to May and late September to mid-October. › Fennessey Ranch, just outside Refugio, where birding tours sight as many as 100 species, from hummingbirds to hawks. › Aransas National Wildlife Refuge, winter home to the only wild flock of endangered whooping cranes. › Laguna Atascosa National Wildlife Refuge, for the chance to see rare and endangered Aplomado falcons along with many other birds. 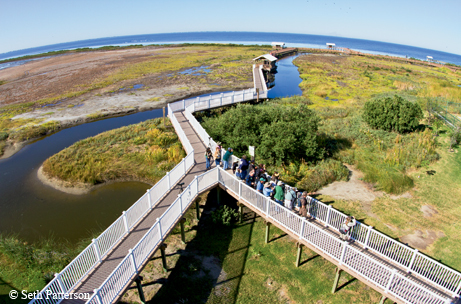 › South Padre Island Birding and Nature Center, with 4,800 feet of boardwalk and seven bird blinds. electricity on the beach and bay. › Matagorda Island National Wildlife Refuge and State Natural Area, on an uninhabited island 38 miles long and one to four miles across, a place to truly get away from it all. No public access, water or electricity – get here by private or charter boat and bring everything you need to hike, fish, bird, watch wildlife and stargaze to your heart’s content. › Matagorda Bay Nature Park, where the Colorado River flows into the Gulf of Mexico, with general and RV campsites, restrooms and showers, picnic areas and a small store. › Padre Island National Seashore, where camping is allowed anywhere along its 60 miles of beach (restrooms and showers at the Malaquite Visitor Center) and at Bird Island Basin on the bay side. › Near Malaquite Visitor Center at Padre Island National Seashore, which has showers, shade and a store. › On Galveston Island’s family-friendly Stewart Beach, where lifeguards staff the stands May through September. › At South Padre Island’s Isla Blanca Park, with a mile of waterfront and two pavilions with showers and restrooms. › Lighthouse Lakes Paddling Trail near Aransas Pass, several loops from 1.25 to 6.8 miles long through a mangrove estuary and seagrass flats, and past the historic Lydia Ann Lighthouse. › Mustang Island Paddling Trail, where the 8.5-mile North Trail, 5.24-mile Shamrock Loop and 6.8-mile Ashum Trail explore the back side of the island and offer views of the Corpus Christi skyline. › The Laguna Madre off South Padre Island, via a glass-bottom kayak rented at South Padre Island Watersports, to take in the sights below and above the water. › The University of Texas Marine Science Institute in Port Aransas, with self-guided tours, educational movies and seven aquariums inside. Outside, you’ll find the Wetlands Education Center marsh and seagrass pond. Next door, Animal Rehabilitation Keep, or ARK, which rescues and rehabilitates sea birds and marine life, isn’t open to the public but accepts donations and injured animals. › Padre Island National Seashore’s Kemp’s ridley sea turtle recovery project, where you can volunteer to train for beach patrols during nesting season and attend public hatchling releases in the summer. › Sea Turtle Inc. on South Padre Island, working to rescue and rehabilitate sea turtles and protect nests – including conducting public hatchling releases in the summer at County Beach Access No. 3. Permanent residents, too injured for release, star in daily educational tours. › Texas Seaport Museum, home to the 1877 tall ship Elissa, in Galveston. › The Great Storm at Galveston’s Pier 21 Theater, a film depicting the hurricane that hit Galveston on Sept. 8, 1900, the deadliest natural disaster in U.S. history. › Corpus Christi Museum of Science and History, which houses artifacts from shipwrecks, the Karankawa tribe and early French and Spanish explorers, plus a replica of Columbus’s ship Pinta and natural history exhibits. › Port Isabel Lighthouse, built in 1852 and a guide for ships until 1905 (except for a brief hiatus during the Civil War), restored as a state park in 1952 and renovated in 2000. It’s the only one of 16 Texas lighthouses open to the public. › The King Ranch, where 825,000 acres – more than Rhode Island – and 60,000 cattle add up to one of the world’s largest ranches, offering guided tours daily, and birding, wildlife and nature tours by reservation. › Ride a ferry, between Galveston Island and Bolivar Point, or Aransas Pass and Port Aransas (both free). 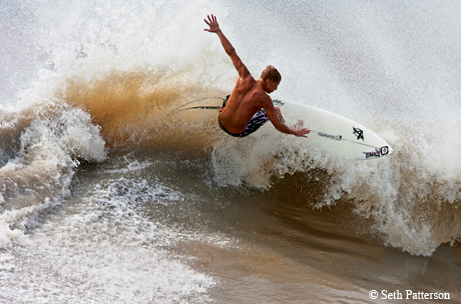 › Learn to surf in Port Aransas or kiteboard on South Padre Island. › Ride a bike on the beach in Port Aransas or along the seawall in Galveston (rentals available). › Ride horseback along the shore, with Horses on the Beach on South Padre and in Corpus Christi, or S-n-G in Galveston. › American alligators in Aransas and Brazoria national wildlife refuges, or at Brazos Bend and Lake Texana state parks. › The Big Tree, an enormous, 1,000-year-old oak at Goose Island State Park near Rockport. › Dolphins, up-close, on dolphin watch cruises from Port Aransas and South Padre Island.